If you’re a new online writer, you might be overwhelmed by this new fact. You may have always thought that working from home or being a writer is a solitary career. I mean writing is a solo and internal process, right? How does networking fit into all of this? Fundamentally, learning how to network means building relationships online (or offline). And the more people you interact with online, the more chances you have at landing an online job. A lot of my success as a freelance writer stemmed from networking the right way. When I was using these tips, I really didn’t understand how important it was or that I was really doing it! I just wanted to get to know other freelance writers in my niche. How Do You Form a Networking Opportunity? Networking is the process of meeting new people – online or offline – with the intention of exchanging information and forming a professional contact. This isn’t to make friends (although you can! ); instead, it’s to help grow your freelance writing business. And what’s so great about this is that the people you network with, may have clients as influencers or have written for large brands or know a lot of contacts in your freelance writing niche. This opens the doors to referral business. After my first year and a half, a lot of inquiries that came my way were referral business from my clients and other writers. The online writing jobs yielded by these contacts made me thousands over time. 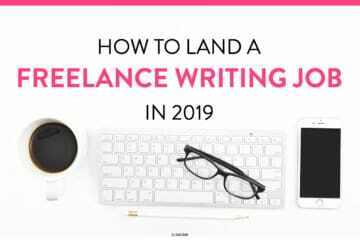 In this guide I want to help you – new freelance writer – learn how to network so that you can gain not only online jobs but high-paying jobs. My first opportunity happened quite soon after starting as a freelance writer. I knew that LinkedIn was the place for professionals and early on I started my LinkedIn profile. I only added my freelance writing work or guest posts I had at the time (which wasn’t a lot). I made sure to fill out my bio and give the right information to show potential clients that I was the writer for them. I also connected with other freelance writers by following their LI profile since I was new and wanted to see who was out there just like me! Little did I know that doing that action resulted in a freelance writing job! A freelance writer I didn’t really know contacted me in LinkedIn and referred a client to me. I then messaged her and thanked her soo much! I couldn’t believe it! I was brand new too! So, as you can see, learning how to network does work! And, what’s even better, networking helped me find my ideal client! A prospect emailed me and told me that a writer referred him to me! And she has done this twice! Amazing! Finally, having these opportunities has lead to other bloggers featuring me! 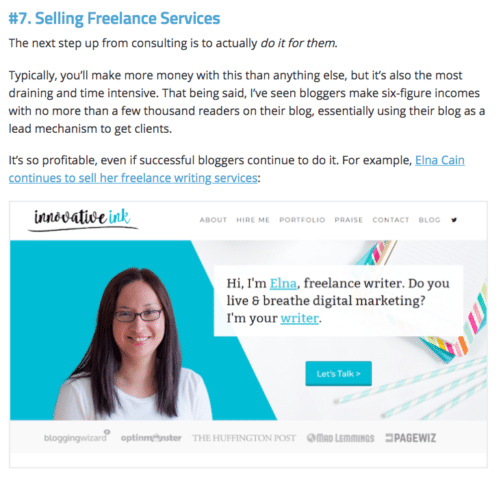 For example, Jon Morrow of Smart Blogger featured my freelance writing business in his blog post. This immediately gave me more inquiries about my writing services. And this worked the other way. Because other writers were generous to pass work my way or feature me, I helped as many writers as I could. So, it works both ways, and it’s highly beneficial. You can’t be a freelance writer on your own; you need help, and you need connections. This was me when I first started too! But, the more I marketed my freelance writing business online, and the more I pitched, the easier it became to be less shy. Don’t get me wrong – I still call myself an introvert – because I still am! Maybe I should have went but I just wasn’t feeling up to it! For me, the act of talking to someone or facing them in real life is harder for me than to shoot off an email or leave a comment. Because of that, I find online writing amazing! Of course, there are the Skype calls I have done and the meetings I did locally. But, I wouldn’t have done this type of “in-real-life” networking opportunity if I didn’t have the confidence from online networking. So, to the shy writer that wants to be a freelance writer and get paid for their writing – online networking is a thousand times easier than “in-real-life” marketing! The process of networking for beginners is quite easy. There are things you can do that don’t involve interacting with another person in the moment. These are passive ways you can get started quickly – even if you are an introvert. The first step is to start a blog. You have to show people online that you are a real genuine person out there! For example, when I get emails from potential clients, I check them out! I check out their blog, their About section or I try to find them on LinkedIn or social media. Why? Because I want to know if this prospect that wants a project from me is legit. And it’s the same idea for prospects, other bloggers and other writers wanting to know about you! And you can alleviate their suspicion by starting a blog, showing who you are and explaining what you do. Writeto1k course student and Writer Website in a Weekend student did a fantastic job doing just that. Immediately landing on her blog, I can tell who she is, that she’s a real person, and what she does. 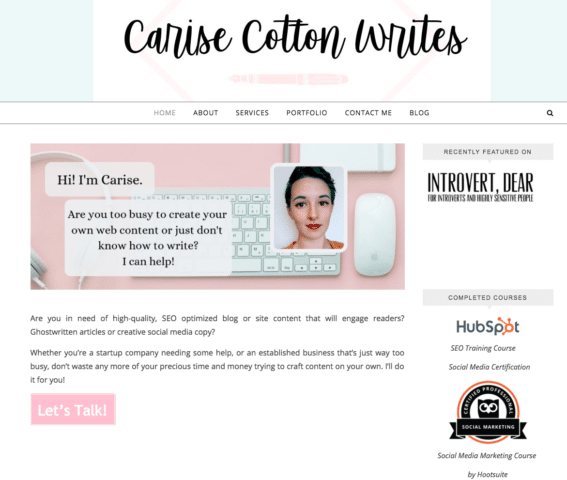 This helps prospects immediately tell if this is the writer for them – but also, tells other bloggers and writers if she is a legit writer or if Carise is in their niche. And guess, what? She identifies as an introvert too! Her blog is authentic and true to herself, and that is what a blog can do to help increase networking opportunities. So make a great first impression with your freelance writer website. Yes, I know this seems easy and a waste of time – but hear me out. Part of my strategy on how to network as a brand new online writer was to get out there! 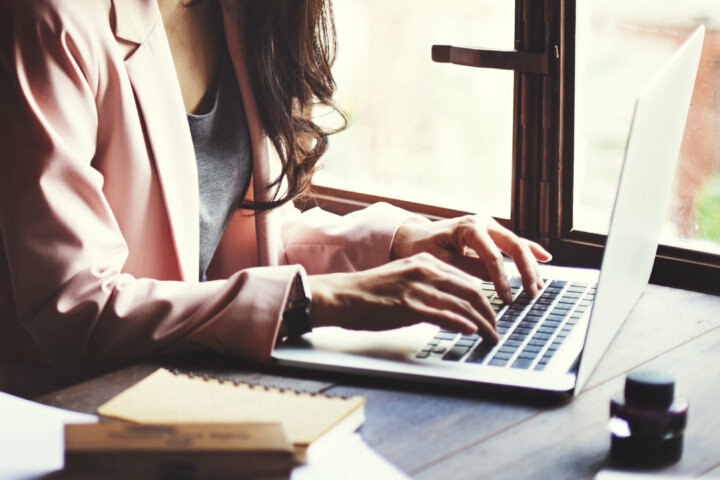 And in my mind – since I didn’t want to chit chat in social circles online, I decided to comment on blogs my clients were reading or that I wanted to write for. And this pays off writers! If you comment in such a way that your comment shows you are a writer, you could get inquiries for potential online jobs. Weaving in that you are a freelance writer! When you begin to network you will always give first concerning offering your services or time. Since you intend to collaborate or land an online job, you have to give up your time or resources. Guest posting fulfills this. Guest posting is the act of having your article on someone else’s’ blog. Some websites are contributor blogs where they seek out guests to write for them. There are free and paid guest opportunities that you can choose from. When I first started, I guest posted for free, and it proved successful. I’ve had prospects email me from reading a guest post and I’ve had the owner of the blog I guest posted on hire me for writing! Again, this simple networking opportunity can help you land high-paying online jobs. How does guest posting help you land more gigs? You receive an author bio in exchange for guest posting. This bio markets your services. You can’t go wrong with that! That’s why I tell my course students how important it is to guest post. Start joining the email lists of the bloggers you want to network with. So, if you are a food writer, start signing up to food blogs like Pinch of Yum’s list. Over time, you can interact with these emails. For example, if an email asks a question, you can hit reply and answer it. And don’t forget to nudge the owner that you are a freelance writer! This opens the doors to more freelance work. You can also join the email list of other freelance writers and email them questions you might have! When I first started, I emailed other freelance writers questions I had like figuring out my rate or my niche. This is a great way to pick their brain and establish a contact. I know many writers don’t want to be on social media because – it’s social! But, I don’t want you to be the next starving writer! The online world is filled with money! Hundreds of thousands of dollars are out there (for you to take) regarding brands online, small businesses online, startups and thousands of solopreneurs that are generating business. But to achieve that level of success, you have to be on social media platforms. You don’t have to be on many – just two to start with. They are Twitter and LinkedIn. Start there and be intentional. Think of LinkedIn as an online resume where you can showcase your work. Think of Twitter as a connection platform where you can follow brands, writers and blogs you want to write for. You can also share your blog posts and other people’s posts. That is the beginning of networking! As I mentioned earlier in this post, you will be doing a lot of giving when networking. You want to be overly helpful and overly gracious when you first start (and of course continue helping out down the road!). An easy way to do this (and not interact with the blogger so much) is to feature them in your blog post. You can talk about their blog or a certain blog post and link to them. One of my freelance writing goals is to start writing for bigger brands. One brand is Neil Patel. He has several blogs and has built up his brand online. For me, the first step to networking is to feature Neil more in my blog content. 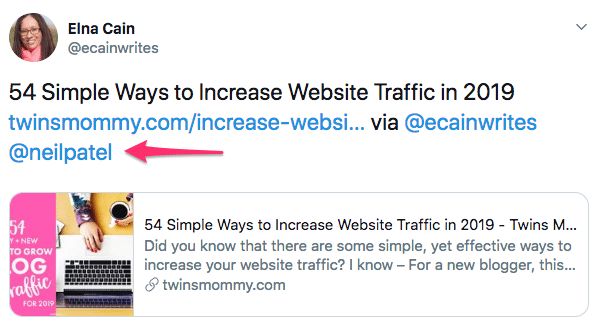 For example, on my Twins Mommy blog post, I feature Neil’s SEO tool Ubersuggest and link to that tool. After you write and publish your blog post, you can go on social media – Twitter – and tag them using the @ symbol. The best networking tip I can give you is to call yourself a freelance writer for hire. This is a powerful title because it tells other people that you are actively seeking work. That’s big! That means if a freelance writer wants to pass off work, they will be looking for the writer that is actively looking for work! So, on social media, on your blog, and in your email signature, label yourself as a writer for hire. Okay – so now that you know the process to start networking to help you get a freelance writing job, let’s go into some solid networking tips so that you won’t fail! Even if you know the process and even if you have convinced yourself that networking is what you need to do to get ahead, you may not succeed. There are some proven tips or ideas that you need to know before you start a networking opportunity as a freelancer. Here are three networking tips to help you out! This tip is by far the most critical to succeed with your networking opportunities. You need to know before you start reaching out to other freelancers or business owners what your plan is. Do you want to gain a new client from networking? Or, maybe you want to connect with other freelance writers and exchange work and advice. Perhaps you know some writers that know bigger influencers and want a way to connect with these bigger influencers (by getting to know the writers that write for them). Knowing your end game can help you decide how you will network with others. I made it a point to reach out to other freelance writers. I tweeted their latest blog post, or guest posted on their site or joined their mailing list. I planted that “seed” early on and when the time came – years later – I asked my “big ask” from them. And other writers have done this with me. Writers I met four years ago are asking me NOW for something. Establishing that relationship early on is important for opportunities down the road. This isn’t give-and-take. Instead, for months or years, you are giving and giving, so that when you ask your “big ask,” it’s no problem for that person. I’ve already talked about this, but it can’t be stressed enough. When you establish that first contact, it’s up to YOU to give more in that relationship. You planted that seed, and now you have to water it and let it grow. One of the first contacts you should be networking with are role models. These are the business owners or freelancers that you look up to. They can help you out if you are new or answer some questions to steer you in the right direction. Now, some of these role models may be busy and may not answer your emails. That’s why it’s important to do other things to catch their attention – like featuring them in your blog posts or client pieces or buying their products to support them. Many writers I network with are course students of mine. Why? Because I communicate with them more than my subscribers or followers. I’m invested in them, and they are invested in their success! But, that’s not to say I don’t respond to comments on my blog – I do – and that doesn’t mean I don’t respond to emails – I do! I want to help as many writers out there as I can! Okay! 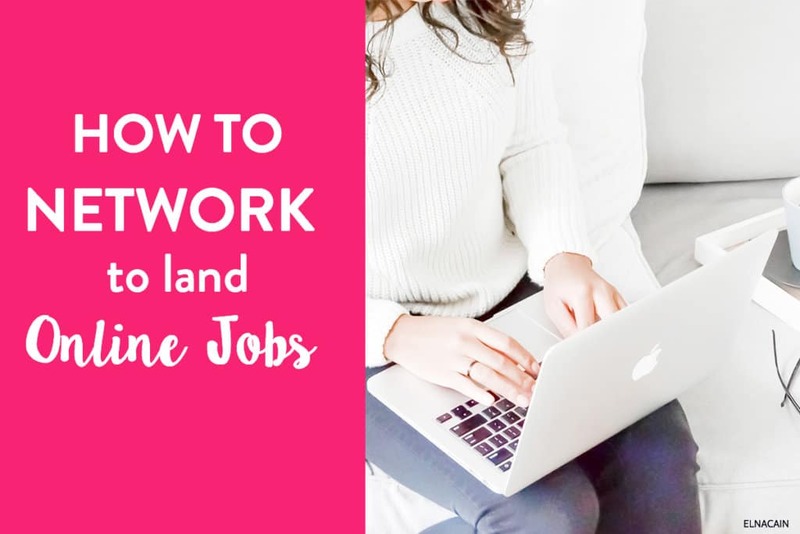 Now let’s talk about how to land online jobs from networking. How does the process work from gaining a new contact to gaining a new gig? The process to land a job from networking is a slow process. You have to nurture your contacts and work hard in the beginning. And when I say long – I’m talking months and years. But, the payoff is worth it. Cold pitching is the act of finding businesses that aren’t seeking writers and pitching your services to them. 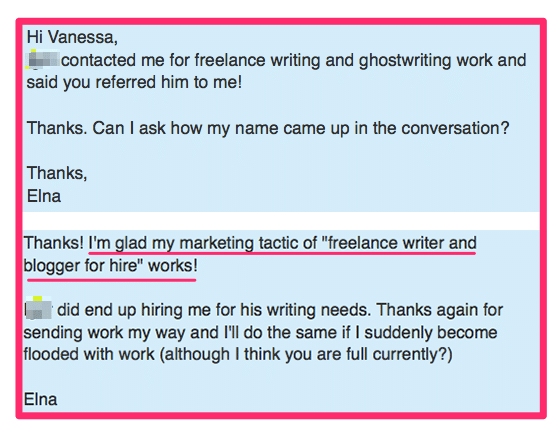 This can be effective to land a freelance writing gig, but a much better approach I’ve had success with is warm pitching. By doing these networking tactics, you are getting in the mind of the blog owner. You are on their radar. This is a good thing. Maybe they will follow you on Twitter. It’s a good thing to note those reciprocal actions from your networking efforts. 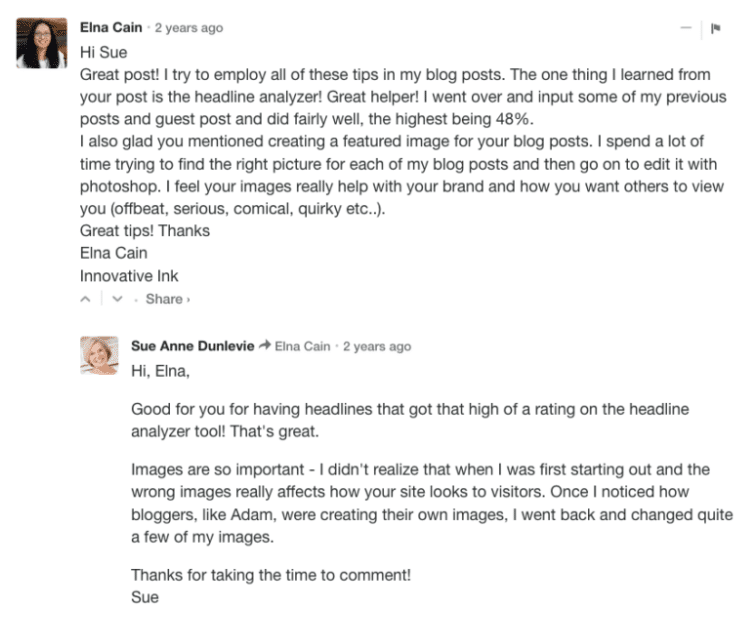 As I mentioned in this post, I like to use blog commenting as a way to gain new clients. And when the blogger responds, I know that I’m on their radar. Sue, hired me soon after commenting on her post. You have to “keep them warm” and you do that by staying in touch. If you follow your contacts on Twitter, retweet their tweets or reply to their tweets. Sometimes you can accomplish your networking goal by going through a third person. 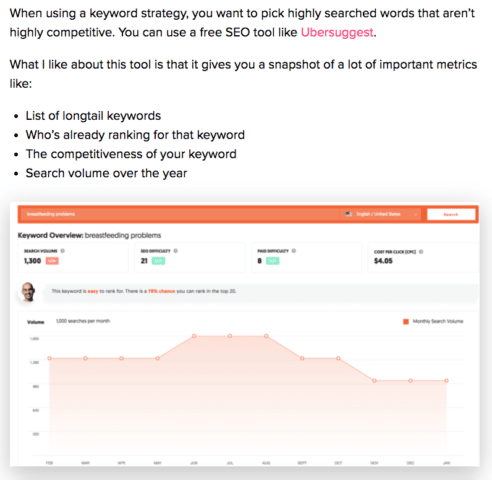 This means finding the blogger or freelancers that knows influencers or business owners. As you will see shortly, a writer I know used this tactic. When you do this – having a third person introduce your networking contact – it can prove to be highly successful. This is the toughest part of networking. It’s the time to stop giving and start asking. Hopefully, you have been keeping this contact warm, stayed in touch and have been doing a lot for them like linking to them or mentioning them in a podcast or in a guest post or client piece. If you think you did all you can and the time has come, you will probably want to draft up an email first. Decide how you will ask them. So, this writer decided to ask me a big ask. This writer I know very well, and we have collaborated numerous times over the years. Her big ask was to do a guest post on a blog that doesn’t accept guest posts and asked me to introduce her to the owner. Her ask was well received, and in the end, she got what she wanted! My networking tips guide for the new freelance writer! Remember – you can’t do this alone. You need help, and you need those connections to be successful. I can honestly say I wouldn’t be here today if it were not for the connections I started early on. 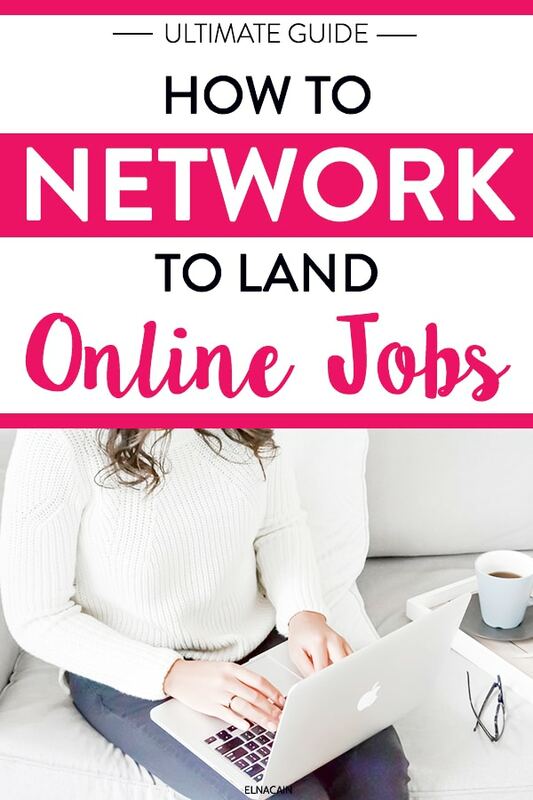 Over to you – are you using networking to land more online jobs or at least connect with other writers? I just love to read all your blog post and share. I have been cracking my head on the best method of networking and today I have the blueprint. 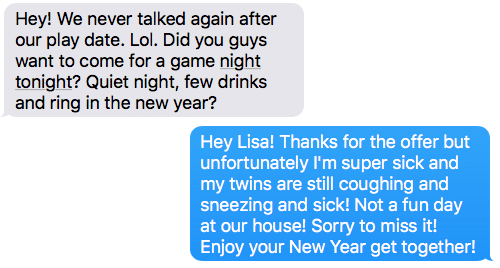 Thanks for coming over! Yes, the big ask for networking takes time. You need to GIVE GIVE GIVE for a long time. For me, it’s years for sure 🙂 Good luck and have fun creating networking opportunities. Thank you so much! Yes, networking isn’t a favorite topic for the masses, but it’s an important topic to understand. I’m glad you are embracing networking and finding some ways to effectively network! Thanks for stopping by! Amazing post! I particularly like the idea with writing your name as – Name | Website when commenting on blogs to help others find you easier. I’m going to implement some of these tips myself. Thanks a lot, Elna! This article is straight to the point. You need networking to succeed as a freelance writer. You can’t do it all alone! Thanks for enjoying this post about networking tips! Introverts unite! I love all of these tips! If I notice that a writer writes at several of the same places as me, I will connect with them on LinkedIn and Twitter, saying, “Hey, I am always seeing your name and noticed we wrote for X and Y together. I would love to be friends.” Befriending other writers in your niche is touchy because it can be so competitive, but it definitely opens up a lot more doors and makes the world of freelancing not so lonely lol. That’s a great template for a networking opportunity. Thanks for sharing that! It’s funny, I got two of my first clients through networking – one was from you (so grateful!) and the other was from someone I talked to on Twitter and we had mutual interests. I’ve had more success with referrals than I have cold pitching – so it definitely works! I’ve also had people ask me to contribute to projects based on my social media presence so I can’t recommend Twitter (and hashtag conversations) enough to people. That’s awesome! Networking is a great tool for freelaners. But, I know it can be a challenge for many! Thanks for sharing your story! I’m not sure how you do it all, but you do it flawlessly! Have you heard of Dream 100 by Chet Holmes? I’ve been studying it lately and your outline here is similar! As always, your content is so valuable without being overwhelming…a rarity when writing about the how-to’s in business! Keep up the great work! Thanks for coming over! Glad you enjoyed this post about networking tips! Elna! 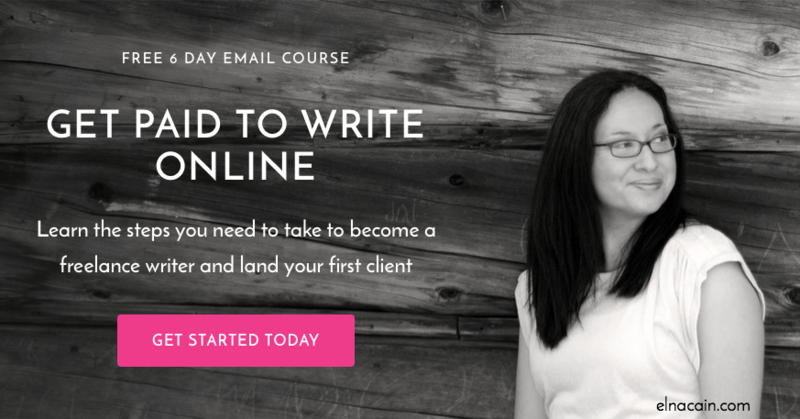 I have learned *so* much from your Write to 1k course and posts. Thank you ever so much for featuring my site here! You have no idea how excited I was to see that!